UPDATE: I have subsequently found that transcribe works beautifully well and comes with some great pedal drivers. It’s a great piece of software and well worth the modest price. UPDATE 2: Please do not follow the instructions on this blog and expect them to work. It was written in 2013 so the software is *very* out of date and I doubt I’ll able to help you if it goes wrong. John Heritage told me to go buy a foot pedal. I picked this Infinity USB-2 pedal up from ebay for $30. It does make a tremendous difference not to have to constantly move one’s fingers from keyboard to mouse and back, although I had mitigated this considerably by using a thinkpad external keyboard with a trackpoint. However, this set-up did have some Rachmaninoff problems – requiring hand contortion to control audio, with attendant RSI/CTS-baiting effects that often resulted in sore wrists during transcription binges. First, I installed the lovely Footpedal GNOME integration control, which sadly seems a bit dormant. After installation, the script didn’t work immediately. I edited the script following Phillip Goodfellow’s instructions. # Bus 002 Device 002: ID 05f3:00ff PI Engineering, Inc.
# idVendor 0x05f3 PI Engineering, Inc.
// , Has anything related to this improved? 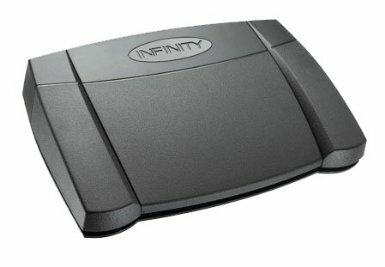 Does the infinity usb-2 footpedal still require a udev rule for it to function as well in Linux as it does in Windows? By the way, I love the way you included enough of the necessary technical context to allow someone who’d never heard of udev to use this. Well done, and thanks for sharing this with us. I’d definitely recommend looking further – I haven’t looked into this for a while so no news from me I’m afraid. I did manage to get a transcription system working with the set-up described above – using Mplayer’s FIFO and gnome footpedal, but it was a little fiddly and didn’t really enable fine-grained control. In the end I stuck with Transcribe! which is a great piece of affordable cross platform software written by a small code shop – so I liked paying for it. Their pedal drivers work really nicely for fine control, and the audio/video playback, EQ and effects are great. They were inspired by footpedal and written for my wife who is a transcriber. Feel free to check out the documentation before deciding whether either one is suitable for your needs. That’s fantastic, thanks so much for pointing me towards these Rolf. I’ll check them out and add them to my howto docs as soon as I have a chance. Great work! I have been using Rolf’s footswitch2 program (or rather, my wife has) and it works very well in Ubuntu 14.04. We’ve never done transcription in Windows. We had to jump through some hoops to get .dss and .ds2 files converted, but the footswitch program is flawless. It has options to speed up/slow down, and a decent EQ (good for those recordings where the doc is in a car, etc). Even worse: the installation attempt crashed my working vlc (version 2.2.2.) installation and even after uninstall, restart and reinstallation vlc is not working anymore. I’ve using footswitch2 but every time i update my software i get a message saying that footswitch2 is 3rd party software and i should uninstall it. My computer gives constant problems and i’m wondering if it could be due to footswitch. nobody is able to find out why the problems. I’ve spent so much money on trying to fix things, that I’m wondering whether to just buy windows again, but i hate the thought of that, and can’t afford them anyway. I am a transcriber so i need to use my infinity pedal constantly to stay alive. I’m really sorry I don’t think you can use footswitch2 on windows/mac (if that’s what you’re trying). I was using it only under linux. Image) – which seems to work very well with most footpedals and operating systems out of the box. Eek. Sorry Olaf – no idea about elementaryOS or the problem you may be having. I’ll update my blog post to let people know not to try this – it’s very out of date.